Traditional saris, woven with heavy silk and gold and silver cloth, are highly treasured and worn during special occasions and festivities within the Indian culture. 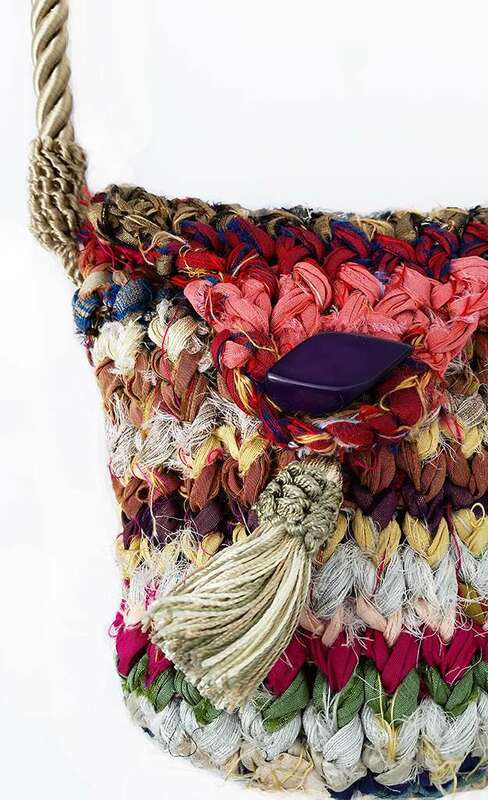 This vibrant and somewhat free spirited handbag is created using yarn made from recycled sari remnants…a wonderful way to enjoy the exquisite beauty of sari silk, with our more casual western ways in mind. Loom: Adjustable Hat Loom, 28 pegs in every other hole. Yarn: Approx 90 yards/143 g of bulky weight recycled sari silk ribbon yarn. Sample used SilkIndian Ribbon Yarn (1.5 skeins in the multi) 60 yds/100 g.
Notions: knitting tool, scissors, yarn needle, row counter, large decorative button, one tassel, one strap (sample uses a curtain tie-back cord). Size: 7” high x 7” wide x 3.5” deep at base. All knits are worked as E-wrap stitches throughout. When working an EW with the ribbon yarn, be sure to wrap and knit off just one peg at a time. Leave extra looseness in each wrap after knitting off, so that the following rows won’t be too tight to manage. Set loom to work in the round using 28 pegs in every other hole. Going in a COUNTER CLOCKWISE direction, Drawstring CO to all 28 pegs. Rows 1-24: Work very loose EW on all 28 pegs. 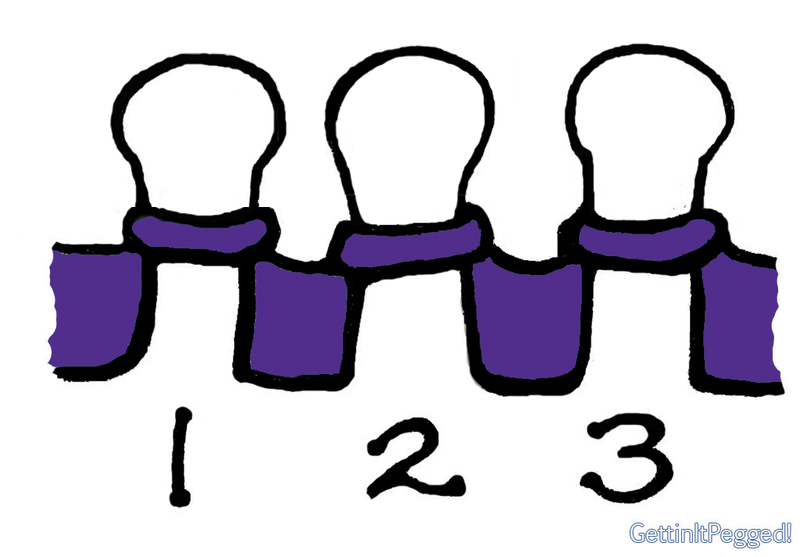 Row 25: Basic BO pegs 1-14, EW pegs 15-28. Row 26: EW pegs 28-15. **Note: The WY should now be on the left side of the pegs being worked. If it’s not, simply switch the diagram below to work as if a mirror opposite. *Move the loop from peg 2 to peg 3 and KO. *Move the loop from peg 1 to peg 2. *EW knit the remaining pegs in line. Row 28: Basic BO first peg of row. EW knit the remaining pegs in line. Rows 29-33: Repeat Rows 27 & 28. When done, there will only be 3 pegs with loops remaining. Row 34: Basic BO first peg in row. EW and KO 4 times on peg 2 only. Move loop from peg 2 to peg 3, KO. Trim yarn and pull through loop. Cinch tightly. Pull tail at CO edge to gather until there remains a 2” opening. Stitch this 2” opening closed so that it will lay flat and serve as the bag bottom. Weave in all ends and trim any long threads from the ribbon yarn’s natural frays. Feel free to stretch the bag and asymmetrical flap into shape. 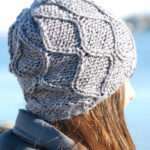 The firm nature of the ribbon yarn allows for some adjustment of the knitting into the preferred form. 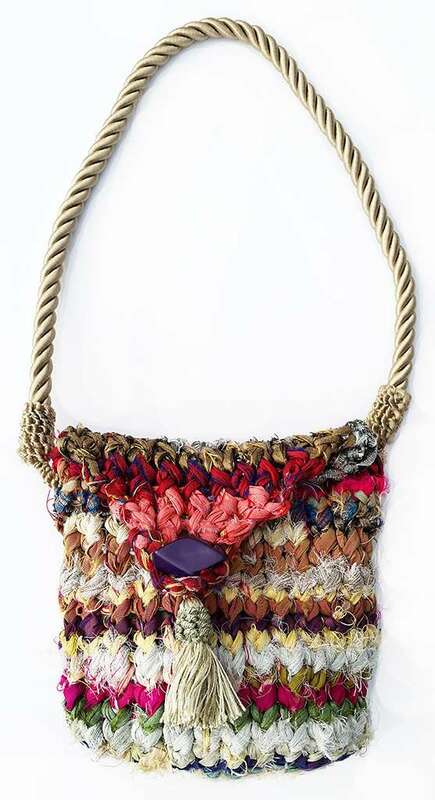 Stitch the button in place at the bag front just inside the button loop, along with the tassel, and handles of choice. If desired, the bag can be lined, or it can be left in its natural state. Is it possible to use any other type of loom? My hat loom pegs broke! 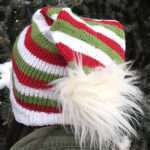 Hi Erin, I would let the company know about the issue of your hat loom by email to info@knittingboard.com. They will be happy to discuss this with you. Can the sashay yarn be used for this pattern? 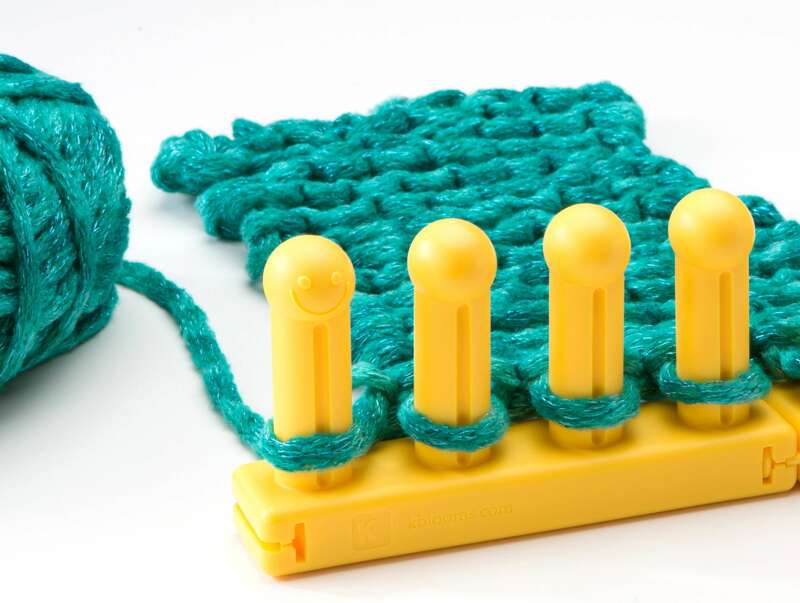 Well, you can use the All-n-One for this, but you would need to change the yarn used, as the silk ribbon used in the pattern would be too thick for the gauge of that loom. Then, of course, you may wish to change the number of pegs used and rows worked so that you end up with the size bag that you wish to have. 😉 I would highly recommend making a swatch first and then doing a little math to determine the desired numbers.